Marc Ravalomanana, born December 12, 1949, is a self made businessman and the former president of Madagascar (2002 - 2009). He resigned in March 2009, during his second term of office and is succeeded by Andry Rajoelina, the former mayor of Antananarivo. Marc Ravalomana was born in the village of Imerikasina, near Antananarivo. In true rags-to-riches fashion, he began his working life selling home-made yogurt off the back of a bicycle. His dairy and oil products business is now the largest non-foreign-owned company on the island. He took to the political stage in 1999 and gained a huge following in Antananarivo. As mayor of the capital he was credited with instigating a major clean-up of the city. The self-made dairy tycoon first came to power in 2002 after an eight-month political crisis which followed elections. He used huge street demonstrations and military force to defeat Didier Ratsiraka, a Marxist, who had ruled Madagascar for 23 years. His first term saw free-market reforms which were welcomed by donors and investors. Aid increased and foreign debt was cancelled. But poverty remained endemic and protesters took to the streets over rising prices. 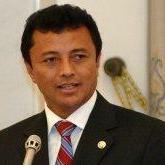 President Marc Ravalomanana won a second five-year term after taking 54.8% of the vote in elections in December 2006. For his second term, Mr Ravalomana has set out a "bold and aggressive" recovery programme - the Madagascar Action Plan. It aims to cut poverty levels by 50% over five years. He described the private sector as the engine of economic growth and said relations with the international community and donors were the keys to development. Voters in an April 2007 referendum supported moves to give the president more powers, notably allowing the head of state to legislate by decree in emergencies. Mr Ravalomana is widely praised for his energy and commitment to economic reform, but analysts question his authoritarian tendencies. Ravalomanana is credited with improving the country's infrastructure, such as roads, along with making improvements in education and health, but has faced criticism for his lack of progress against poverty; purchasing power is said to have declined during his time in office.